Skywebber is not a complicated browser infection; however, it could be dangerous to your security. 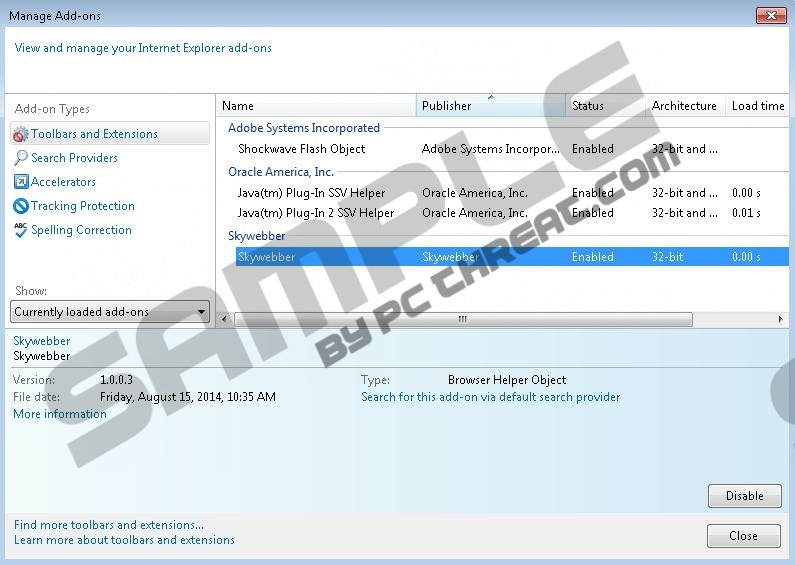 Malware researchers are familiar with the activity of this suspicious plugin because it is a clone of PodoWeb, HasBrowse, SunriseBrowse, and other application created by the infamous SuperWeb LLC. This company creates programs which are not actively promoted via official websites and which allow third parties promote different offers, surveys, installers, sweepstakes, etc. These are important reasons leading is to state that Skywebber removal should be performed as soon as possible. As mentioned before, the official Skywebber website (skywebber.com) is not active. By this we mean that the download (Start Now) button, which is meant to provide the installer of the program, has been disabled. Of course, if the program was inactive, we would not be concerned about its removal. So far, the application has been discovered travelling with third-party software. It is promoted using fake offers, such as bogus Java update installers, which proves that the program is unreliable and requires removal. Unfortunately, advertisement-supported software, like Skywebber, is often created to allow schemers and unreliable companies distribute malware, activate phishing scams, and trick computer users into disclosing sensitive contact information. The removal of this software is often performed too late because it is represented deceptively. Overall, regardless of the services promised by adware, you need to ignore the displayed ads to ensure that you do not face serious virtual security risks. Since the services provided by adware are possibly unreliable, you should delete Skywebber. If you click the download button below and install the automatic malware removal tool SpyHunter, it will identify and remove the infection as Adware.SkyWebber and PUP.SuperWeb. We are not against the manual Skywebber removal, and the instructions below will help you initiate the process; however, there is no doubt that authentic security tools will remove malware, adware and unreliable applications most effectively. This option should be particularly interesting to those who are confused about the manual removal and those who desire to activate reliable Windows security shields. Find the Start icon on the Task Bar and click it to open a menu. Open the Control Panel and then double-click Add or Remove Programs. Move to the Task Bar, click the Start (Windows logo) icon and select Control Panel. Go to Uninstall a program and locate the program you wish to delete from the PC. Right-click the undesirable program and select Uninstall. Access the Metro UI menu and right-click on the screen. Click All apps. Select Control Panel to open a menu with more options and click Uninstall a program. Quick & tested solution for Skywebber removal.